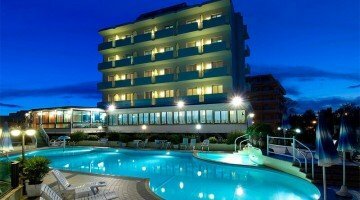 The Strand Hotel Colorado , completely renovated, is a 3-star hotel directly on the beach of Lido di Savio. It has a swimming pool, a private equipped beach, a wellness area and services for children. Admits small animals. 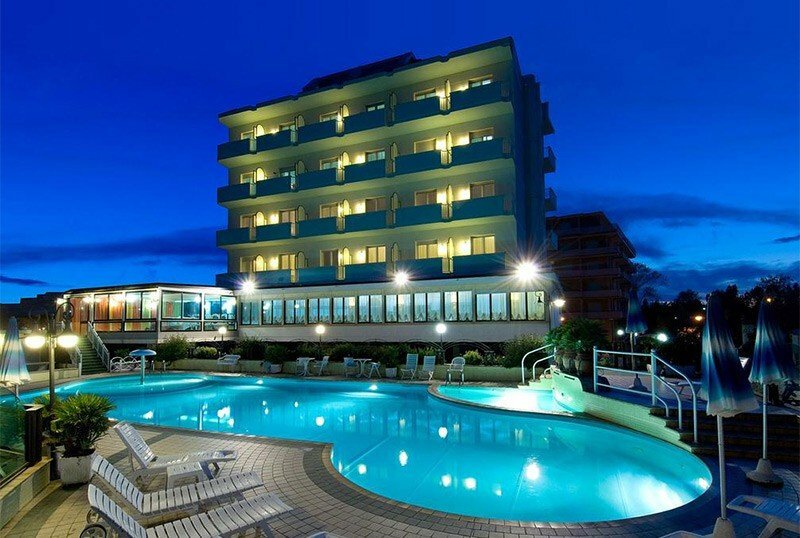 The hotel is located in Lido di Savio, with direct access to the private beach through the garden. The location is convenient for visiting Mirabilandia. All rooms have a balcony, air conditioning, satellite and digital TV, safe, telephone, minibar, bathroom with shower and hairdryer. MARINA: silent, with the services described above. COLORADO: with a frontal or side sea view balcony (subject to availability). In addition to basic services, it offers rich courtesy set, bathrobe. Includes beach service with beach towels and free access to the hydromassage pool. FLORIDA: to the services of the "Colorado" room adds the all-inclusive treatment, with the possibility of lunch on the beach. Private beach with beach bar, swimming pool, heated hydromassage, gym with massage room, free use of bicycles, reading room, lift, beach towel, laundry service. Theme nights are organized. PARKING: uncovered and free, for all customers. CONVENTIONS: private beach, amusement parks, "Le Siepi" equestrian center. SERVICES FOR DISABLED: entrance located on the ground floor with a sloped ramp, a standard elevator, room with wheelchair maneuvering space. LUNCH AND DINNER: 4-choice menu accompanied by buffet of appetizers and vegetables. OTHER: on request it is possible to have lunch or dinner also by the swimming pool. In hotel: children's pool, outdoor playground area, strollers, entertainment, baby sitter. Pediatrician on request and for a fee. On the beach: children's playground area, table tennis. The pool is large, with a hydromassage area and a warm cervical waterfall. It is surrounded by a solarium area equipped with sun loungers, from which you can freely access the private beach. The hotel has a private beach with games for children, showers, table tennis and canoe and pedal boat rental. Prices are per day per person in double room, with full board, for minimum stays of 7 nights (excluding long weekends). - To confirm a reservation, you must pay a deposit as guarantee. - Reservations are confirmed only upon receipt of the entire deposit. - For stays of more than 3 nights, the deposit is 30% of the total. For stays of less than 3 nights, the deposit is the amount of the first night of stay. It varies according to the booked period.